Foreign Minister Dr AK Abdul Momen on Wednesday urged UNHCR special envoy and superstar Angelina Jolie to organise a mega event in Hollywood engaging her other colleagues in an effort to mobilise public opinion worldwide highlighting the plights and rights of Rohingya people. "I proposed her to organise a mega event in Hollywood to create public opinion for Rohingyas as she is a big voice," he told reporters after his meeting with Jolie at the Ministry of Foreign Affairs. The Foreign Minister referred her to the "Concert for Bangladesh of George Harrison" held in New York in 1971 that had created huge public opinion in favour of Bangladesh War of Liberation. The Hollywood megastar arrived here on Monday morning and visited Rohingya camps to assess their needs. The Foreign Minister said Jolie wants the safe return of Rohingyas to their place of origin in Rakhine State. Famous Hollywood actress Jolie on Tuesday urged the Myanmar authorities to show the genuine commitment to end the cycle of violence, displacement, and improve the conditions for all communities in Rakhine State, including Rohingyas. 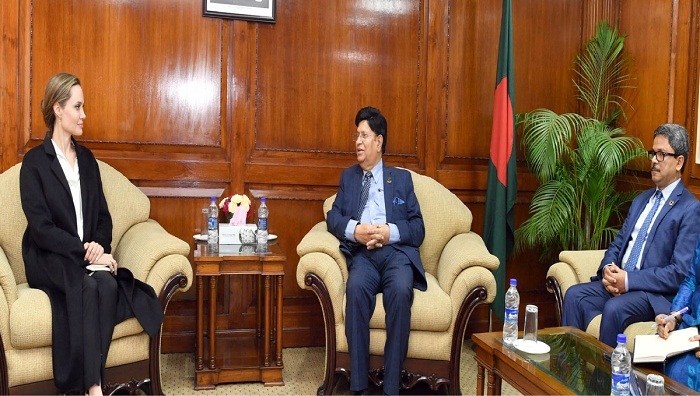 The special envoy was scheduled to conclude her Bangladesh visit after holding official meeting with Prime Minister Sheikh Hasina on Wednesday evening. During the meetings so far, she discussed how UNHCR can best support the current response led by the Bangladesh government, along with the need for safe and sustainable solutions to the plight of one of the world's most persecuted minorities.